Philanthropic foundations are empowered by a pool of financial assets which earns the income that is distributed to charitable agencies. Without those assets there would be no grants. More to the point, however, without the charitable agencies which we support the Thomas Sill Foundation would be irrelevant and our society would be impoverished. We are always pleased to visit the charities which seek our help and we are gratified to be apart of their work. In our 2006-07 year cash grants were made to 91 charities in the amount of $1,170,811. Individual grants ranged in size from $500 to $100,000 including some multi-year grants. The average grant was $10,053 on an annualized basis. 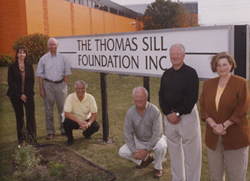 The Thomas Sill Foundation is proud to serve all of Manitoba. Approximately 59% of our grants were awarded in Winnipeg with 41% being invested in rural and northern areas. All grants can be viewed by clicking “Enter Annual Report” below. New to the list of special projects, and this year’s visual theme for the annual report, is the Lake Winnipeg Project. Descriptions of this and other special projects can be found by clicking on “Programs/Projects” above.